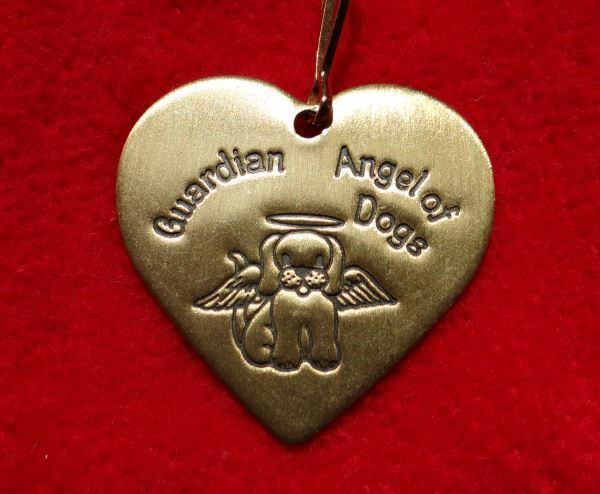 "GUARDIAN ANGEL OF DOGS" is inscribed on the front of the Polished Metal Heart Dog Collar Charm along with a picture of a dog with angel wings and a halo. The back could be inscribed with your pet's important contact information. There is a clasp for attaching the Polished Metal Heart Dog Collar Charm to your pets collar. The heart measures 1 1/2" from top to bottom and 1 1/2" across.